Premium Camping is the pick of the camping grounds and now you can reserve it! Reserved Camping allows you to arrive at anytime and be confident that a nice flatter patch of grass will be waiting for you, but you’ll need to act fast as only 500 reserved camping passes are available and better locations are allocated in order of purchase. Each section has a limited number of passes. When a section reaches it’s allocation it will be removed from sale. So reserve sooner, rather than later! This pass will allow a single vehicle and it’s occupants entry to a selected section in the the reserved camping ground. All occupants must also have weekend passes (Kids Passes available free for 12yo and under on entry). Sections 6-8 are restricted to Weekend Family Pass holders only. All sections have now been released with sections 6-8 reserved for people coming in on a Weekend Family Pass (when prepaid online, includes a Premium Camping pass). People buying a family pass may also still select other sections of the camping ground should they wish to camp with family and friends coming without a family pass. Group Orders: if you are wanting to camp with a group of other campers, it’s best to have one person from your group buy all the camping passes in a single order (in the same section). Our staff will do their best to reserve a large enough area for all your reserved camping passes. If you purchased a section in the Premium Section, this will be shown on your invoice and ticket. 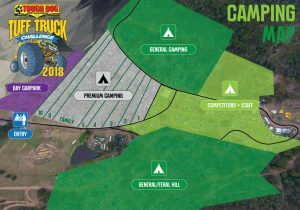 If you didn’t upgrade to a Premium Section, your Weekend Pass will allow you to camp anywhere in the General and Feral Hill areas (first-come, first-served). The Pits are not open to the public, but much of the pits can be seen through the fence on the way to the Day Stages. To speak with the teams and see the Trucks up close; the show and shine on Friday is a must. Will Feral Hill be open from the outset this year? Previous years have seen it closed until Saturday which becomes a real issue for finding a space on Friday night. Feral Hill always opens at 8am friday.. The General Overflow section above the mudrun is only opened once the majority of space is full. I have a Camper Trailer. i’m looking to camp in the ferral hill or general areas. Is there an additional fee for the trailer? To order this online, you would have to order one premium camping spot with trailer, & then one on its own.